Today I will recommend a healthy Thai restaurant to everybody is Anajak Thai. Anajak Thai is an Thai restaurant about to come up on its 28th year anniversary. This Thai restaurant is a local favorite serving contemporary and healthy food . Anajak Thai has a unique flavor that appeals to the Western palate. This thai restaurant has an upscale casual environment perfect for a date, family dinner or business meeting. The décor is crisp and clean with white table cloths, classic Thai paintings and soft lighting. 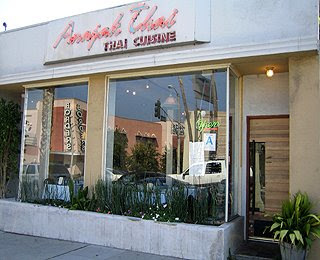 Anajak Thai is a warm and welcoming family owned and operated restaurant serving lunch, dinner and take-out. This Thai restaurant also specializes in private parties and catering. Come visit today!